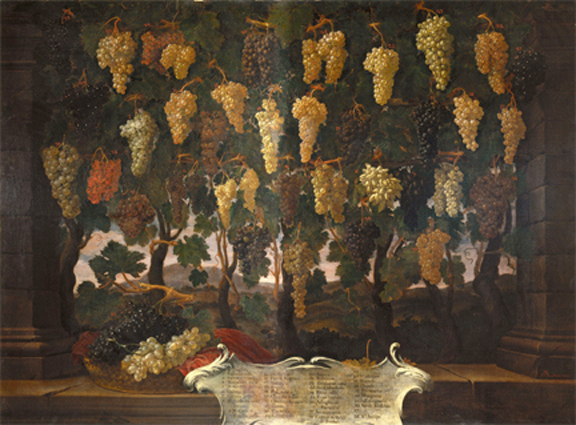 Above: “37 Uve” (“37 Grape Varieties”) by Tuscan naturalist painter Bartolomeo Bimbi (1648-1729). The painting was executed nearly 100 years after the publication of the passage below and was commissioned by Cosimo III de’ Medici. The author of the below passage visited Tuscany when Cosimo II ruled the “Dukes State of Tuscany.” The painting resides at the Medici Villa Poggio a Caiano and was part of a series of paintings commissioned by Cosimo III to document the agricultural products of Tuscany. Today’s post comes from ante litteram Italian wine blogger Sir Robert Dallington (1561-1637). “As writer, traveler, courtier, and pioneer of taste Sir Robert Dallington made a largely unacknowledged contribution to the culture and thought of Elizabethan and Stuart England. He had an unusual and successful career: The poor Northamptonshire village boy who was to become the respected counselor of two royal princes, Henry and Charles. No satisfactory account of his life and work exists, since apart from a brief and incomplete entry in the Dictionary of National Biography all we have are a few scattered notices of his books” (“Sir Robert Dallington (1561-1637): Author, Traveler, and Pioneer of Taste” by Karl Josef Holtge). In 1605, Dallington published A Survey of the great Dukes State of Tuscanie [sic], an account of his trip to Tuscany in 1596 (he accompanied his pupil, Roger the 5th Earl of Rutland, a member of the Manners family, “wealthy landowners, courtiers, connoisseurs, and travelers,” on Roger’s grand tour of Italy, France, and Germany). In it, he devotes a few passages to descriptions of grape growing and winemaking, including the one that I have transcribed below. I wanted to share it here to give readers a sense of the radical differences between Tuscan viticulture before the industrial era and the present era. A few weeks ago, we posted a couple of excerpted translations from an agriculture survey published in Italy in 1882 (here and here). As those documents reveal, by the end of the nineteenth century, grape growers and winemakers had grubbed up many of their vineyards and, following Baron Ricasoli’s lead, had replanted predominantly to Sangioveto (Sangiovese). But until that time — I believe — viticulture in Tuscany was widely varied and not focused on the production of fine wine, as Dallington recounts in the passage below. I hope you find it as fascinating as I do. I have introduced modern spelling and punctuation for clarity’s sake but have retained some of the Elizabethanisms where possible. From “A Survey of the great Dukes State of Tuscanie,” by Sir Robert Dallington, 1605, folio 32. The Vine, which without comparison is the greatest commodity of Tuscany, if not of Italy, hath these uses. Of the Grape they feed, of the juice they make Wine; of the shreddings they make small bundles, like our Fagots of Gaule in Cambridge, and sell them for twoquatrini a piece for firing; of their leaves they feed their Oxen or else dung their land; and lastly of the stones they feed their Pigeons, which after the Vintage they riddle out of the Grape being dried, and these they sell at 20 soldi the Staio [sextary]. There are diverse sorts of Grapes, the names of such as I remember are these: Uva Canaiola, good either to eat or for Wine; Passerina, a small Grape, whereof Sparrowes feed [hence the name, from passero, Ital. for sparrow], good only for Wine; Trebbiana, the best sort of white Grapes for Wine, whereof they make their Vin Trebbiano; Zibibbo, these are dried for Lent; Moscatella with a taste like Musk, not for Wine for to eat; Uva grossa, not to eat but for Wine; Raverutta, of itself neither to eat nor for Wine but a few of these put among a great vessel of Wine, giveth it a color, for which use it only serveth; San Columbana and Rimaldesca a very delicate Grape, either for Wine or to eat; Lugliolawhich hath his name for the month of July wherein in is ripe, better to eat than for Wine; and lastly Cerisana, named for the taste it hath like a Cherry, better for Wine than to eat. Iniziando da Chianciano Terme, ecco le nuove piscine termali Theia, i bagni degli etruschi, che vanno ad arricchire l’offerta del Sistema Termale Senese. Queste piscine, inaugurate di recente, sorgono adiacenti allo storico centro termale Sillene e comprende sette piscine, suddivise tra interne e esterne. L’acqua che le alimenta è ricca di anidride carbonica, carbonato di calcio, bicarbonato e solvati, e svolge un’efficace azione antinfiammatoria sul sistema muscolo-scheletrico, e nutritiva per la pelle. Le piscine sono dotate di giochi d’acqua e idromassaggi. 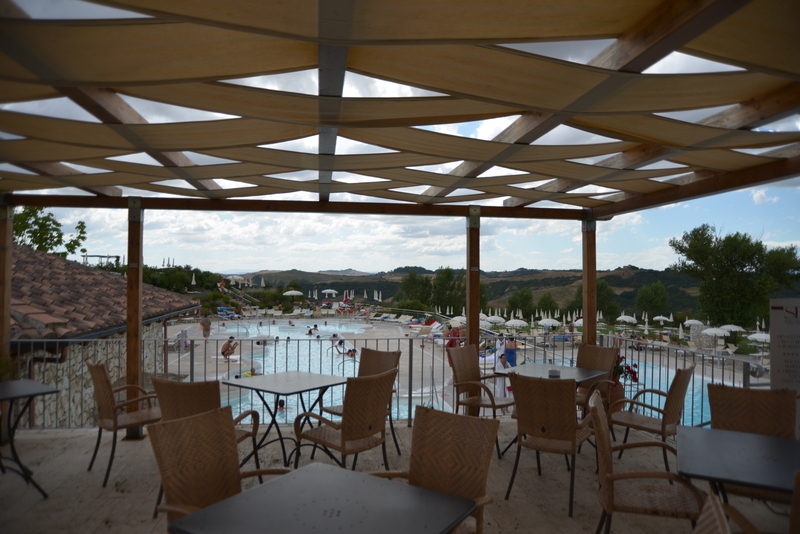 La ricerca del benessere prosegue nella piscina termale di Bagni San Filippo, nel comune di Castiglion d’Orcia, alle piscine del Monte Amiata. L’ampia piscina è alimentata da cascatelle di calda acqua termale, sotto le quali si può godere di un rilassante e benefico idromassaggio naturale. Il tutto è particolarmente suggestivo in inverno, quando il vapore che si alza dalla superficie crea un’atmosfera molto surreale. A poca distanza, nei pressi della Via Cassia, sorge Bagno Vignoni, nota fin dall’epoca romana per le sue acque termali, che sgorgano dal sottosuolo ad una temperatura di circa 50° C.. A sfruttare le loro proprietà, utilissime per artrosi e reumatismi, sono tre poli termali: l’Hotel Posta Marcucci, l’Adler Thermae, e l’Hotel Le Terme. Più a nord, nel cuore delle Crete Senesi, la cittadina di Rapolano Terme custodisce due strutture termali: Le Terme Antica Querciolaia, con un sistema di piscine coperte e scoperte alimentate da sorgenti a temperatura differenziata, e le Terme San Giovanni, le cui acque sono particolarmente indicate per trattamenti dell’apparato motorio e respiratorio. Il comune di San Casciano Bagni ospita il Centro Termale Fonteverde, le cui piscine sono alimentate da ben 42 sorgenti a diverse temperature. Da non perdere sono anche le Vasche Termali Terapeutiche delle Terme di Petriolo, con acqua ipertermale a 43° C.
Ci-dessus: La vigne de la Porta di Vertine dans le coeur du Chianti Classico (dans la commune de Gaiole in Chianti). A noter la forme à amphithéatre. C’est une question que l’on nous pose souvent: quelle est la différence entre le Chianti et le Chianti classico? Une question immédiatement suivie de cette autre: quelle est la meilleure appellation? Le Chianti et le Chianti Classico sont deux appellations différentes, en d’autres termes les raisins utilisés poussent dans des lieux différents et les règles de vinification son différentes, quoique semblables. L’appellation “classico” pourrait faire sembler le Chianti Classico plus “typique” ou de qualité supérieure. Ce n’est pas le cas, meme si les règles définissant le Chianti Classico sont plus strictes du Chianti, plus libéral. Las raisins du Chianti peuvent etre produits dans les provinces toscanes suivantes: Florence, Sienne, Aezzo, Pise, Pistoia et Prato. Les raisins du Chianti Classico ne peuvent etre produits dans les provinces de Florence et de Sienne que dans les communes suivantes: Barberino Val d’Elsa, Castellina in Chianti, Castelnuovo Berardenga, Gaiole in Chianti, Greve in Chianti, Poggibonsi, Radda in Chianti, San Casciano Val di Pesa, Tavarnelle Val di Pesa. Le principal raisin utilisé dans les deux appellations est le Sangiovese. Dans le Chianti 70% de Sangiovese suffit pour l’appellation. Le Chianti Classico ne permet que des raisins noirs, le Chianti permet jusqu’à 10% de variétés de raisin blanc. Il y a d’autres différences encore, notamment le Chianti Classico doit vieillir pendant pus longtempts avant d’etre mis en bouteille: 10 mois minimum pour le Chianti Classico, 3 mois minimum pour le Chianti et 9 mois minimum pour le Chianti Superiore (dénommination du Chianti). Chianti et Chianti Classico sont des AOCG appellations d’origine controlée et garantie. 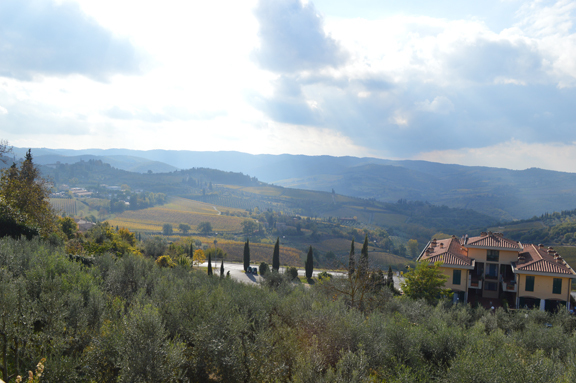 Above: The view from Panzano in Chianti. It means step son, god son, or adoptive son in Etruscan. In turn, it comes from the Etruscan clan which means son. The other theory, which few take seriously, is that it comes from the Latin clango, meaning to clang. The idea would be that Chianti got its name from the sound of cowbells worn by the ubiquitous livestock there — a thesis nearly impossible to support and easily discredited. But after enough digging around the internets, I found the site of Massimo Pittau, one of the world’s foremost authorities on Etruscan language and the history of the Italian language. 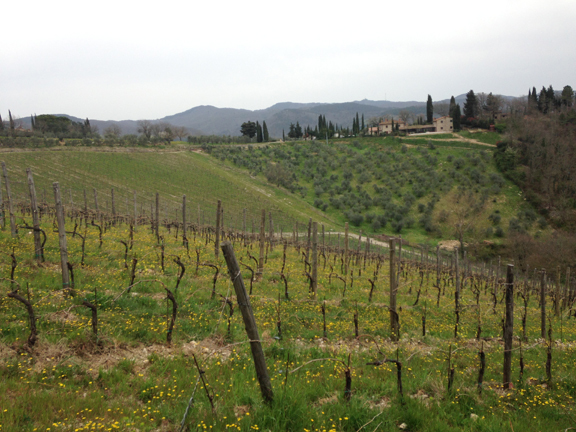 He has proposed that Chianti comes from the Etruscan Ciante, which was pronounced kee-ahn-teh in the ancient language. Although no one knows its original meaning, it is a well-documented aristocratic family name that can be found in at least two major inscriptions in Tuscany from the Etruscan era. Because we know that the Etruscans grew grapes and made wine in Chianti, writes Pittau on his website, it’s highly probable that the Ciante family owned vineyards there. Philology is and has always been an inexact science. And as with any etymological research, it’s practically impossible to arrive at a definitive, water-tight answer. But Pittau’s theory seems — at least to me, a trained philologist myself — the most tenable. In my view, the value of this type of research is not the final answer but rather the process that leads to an answer — even when there is none. La Porta di Vertine in the U.S. Categories: Agritourism, Chianti farmhouse holidays | Tags: Chianti, Vertine | Permalink.